The Next Generation Aeronautical Innovation Hub Center works to create initiatives that can benefit industry and society, drive open innovation, and deliver high-impact results to ensure　maximum benefit to society by working together with diverse players - airlines, manufacturers, suppliers, and research institutions and academia - to achieve shared visions. 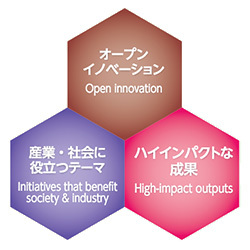 Through facilitating open innovation with such a multidisciplinary and crosssectoral approach, JAXA is aiming to create innovative solutions to social issues and provide new value to society. FLIGHT PATH No.15/16 "Challenge of the Next Generation Aeronautical Innovation Hub Center"
FLIGHT PATH No.11/12 "The Next Generation Aeronautical Innovation Hub Center"